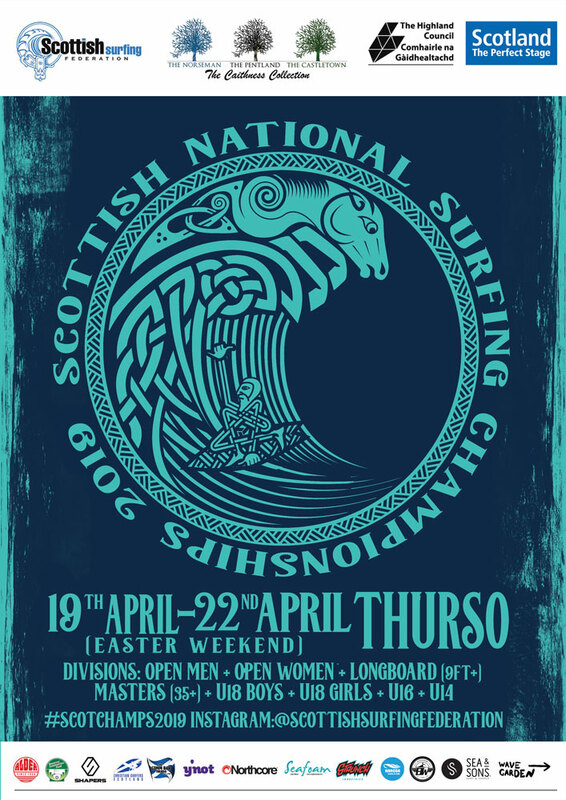 12/04/19 – Entry to the Scottish National Surfing Championships was closed on the 09/04/2019. This year for the first time ever the Scottish Nationals will have live scoring courtesy of Welshman Tim Aylett and his Refresh system which will allow judges to punch the scores into tablet computers which will automatically update live on the internet so people can follow the scores. The use of the new technology has been made possible by funding from EventScotland for this year’s event. Event updates regarding running order, results and venue changes will be posted on the Scottish Surfing Federation facebook group. All competitors in the draw must checkin at the meeting at 8pm in the Pentland Hotel Thurso on Thursday the 18th of April. Anyone who cannot make the meeting must have someone checkin on their behalf. The annual Scottish National Surfing Championships will take place in Thurso between the 19th and 22nd of April 2019. Competitors will compete in 8 divisions for national titles; Open Men, Open Women, Longboard (Board 9ft +), Masters (Over 35), U14, U16, 18 Boys, U18 Girls. Entry to competitors is now open and closes on the 5th of April. Reigning champions in the Open Men and Open Women’s divisions are Mark Boyd and Phoebe Strachan both of the Thurso based North Shore Surf Club and have both entered the event to defend their titles. Competitors and officials will meet at 2000hrs in the Pentland hotel on the 18th of April for a competitors and officials brief. The event is due to start on the morning of the 19th at Thurso-East, Scotland’s premier reef break. A social event will take place in The Pentland Hotel, Thurso at 1900hrs on the 20th of April to raise funds for the SSF and there will be an event banquet at 1800hrs on the 21st of April at the same venue possibly followed by some or all presentations depending on event progress with the remaining presentations taking place at Thurso-east on the 22nd of April if the event not completed. As always, the schedule is subject to surfing conditions and all 4 days can be used to have optimum surfing conditions for competitors. On the Saturday Red Bull will be at the event with their wings team and PA truck. Main supporters of the event this year are the Highland Council, EventScotland part of VisitScotland’s Events Directorate and the Pentland Hotel. Paul Bush OBE, VisitScotland’s Director of Events, said: “We are delighted to be supporting the Scottish National Surfing Championships, which will see some of the country’s best surfers compete at Scotland’s world-renowned reef break, Thurso-East. Surfing is one of the most exciting events on our annual sporting calendar, and the Championships promises to be a fantastic, action-packed event for both competitors and spectators alike. The event will be used to choose the teams for The British Championships & British Cup in Jersey, European Surfing Championships in Portugal and Celtic Cup in Ireland.